Did Ford Confirm 2015 F-150 MPG With a Clever Easter Egg? Here’s an interesting catch made by a Jalopnik reader combing through the “Technology That Works” section of the 2015 F-150 product page: an image that may or may not show the next-gen pickup’s fuel economy. 18.8 MPG confirmed? Where’s Gabe Newell? 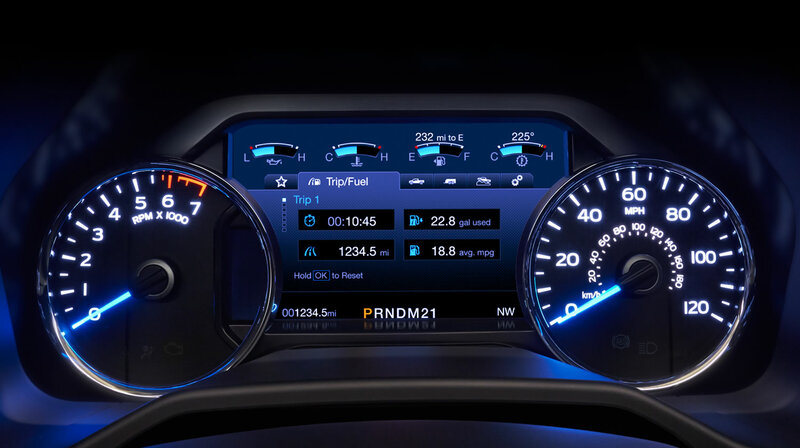 The image, which shows off an available 8” productivity screen, shows the F-150 averaging 18.8 miles per gallon. For reference, the current-gen F-150 gets 17 mpg city and 23 mpg highway, so if the reading is representative of anything it’s likely to be city or combined fuel economy. While 18.8 mpg is feasible for the 2015 F-150, particularly given the emphasis on lightweighting, it’s not by any means a figure that we can take as gospel. The rest of the numbers on the gauge are somewhat arbitrary: it shows that the truck has been driven 1,234.5 miles, which suggests that someone in Ford’s advertising department is probably lazy about their password strength, and that a mere 22.8 gallons of gasoline have been used. If we abide by the idea that 22.8 gallons of gas could propel the 2015 F-150 almost 1,250 miles, then we can expect it to return fuel economy around 54 miles per gallon. That’s…pretty good. Considerably less doable than, say, 18.8 miles per gallon, but still doable. Ford could have been developing tube technology and hydrogen powered range extenders all this time. You never know.